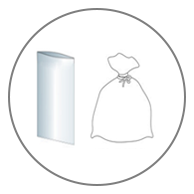 Garbage bags are made of polyethylene and compostable materials. These are made in different variants.- in various sizes and film thicknesses. These are commonly used as trash can liners and waste disposal for home and institutional uses.